Sakai Guides and DocumentationSakai Complete User Guide GradebookHow do I override a course grade in Gradebook? When manually entering a course grade, you must use the appropriate grade type for the gradebook schema you have selected. 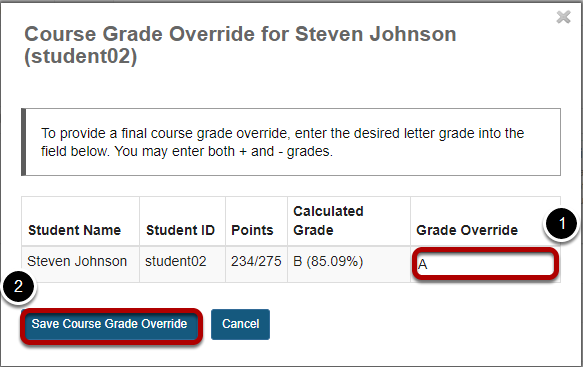 For example, if the course is graded on a simple letter grade scale, you will only be able to enter the letters A, B, C, D, or F. If the course is graded on a standard letter grade scale, you will also be able to add + (plus sign) or - (minus sign) to the letter grade. If the course is graded on a Pass/Not pass scale, you will only be able to enter the letters P or N.
A numerical value for the override can be entered, however the value will be mapped to the letter grade scale. For example if the letter grade scale is set so the minimum % for an A grade is 95 then entering a numerical value of 97 will be mapped to 95%.